The traditional custodians of this land, Australia’s First Nations peoples, continue the struggle for justice, reparation and recognition in the face of political hostility and entrenched racism. This is a struggle for all Australians as the nation seeks to come to terms with its past, present and future. The future of Australia as a just, peaceful and regenerative society depends squarely on wholesale decolonisation. 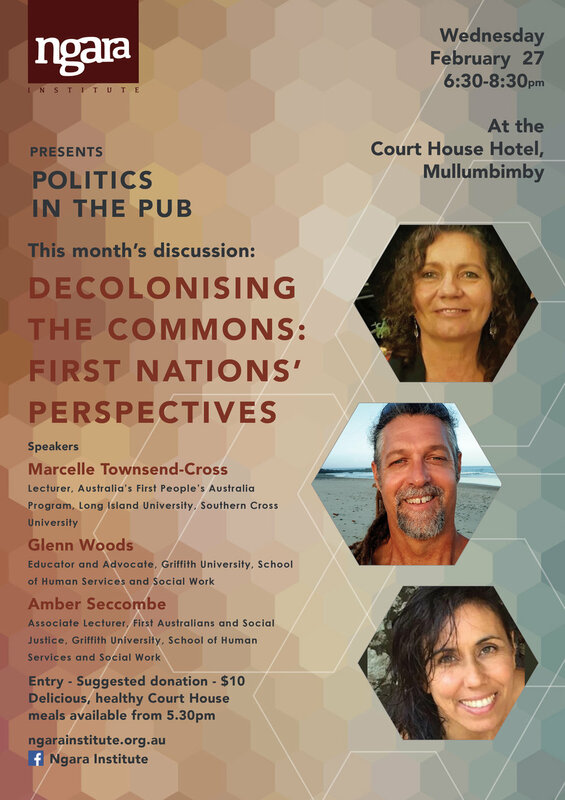 This year’s first Ngara Institute Politics in the Pub, on Wednesday 27th February, features three Indigenous speakers – academics, activists and commentators, Amber Seccombe (Griffith University), Glenn Woods (Griffith University) and Marcelle Townsend-Cross (Long Island University/Southern Cross University) – reflect on these matters and what decolonisation means in practice for all of us. Located at the Courthouse Hotel, Mullumbimby, the event starts at 7pm. But please remember to come early for food and refreshments and to avoid the crush! Doors open at 5.30pm.